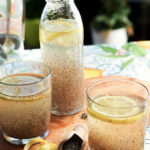 Lemon Chia Fresca is a delicious all natural health drink. Simply put Chia Fresca is chia seeds in water with some lemon juice and sweetener. Better than any fancy flavored mineral water, chia fresca keeps you happy and hydrated, provides the necessary muscle building protein post-exercise, helps in weight loss and also boosts the metabolism. Combine all the ingredients in a jar. Mix it really well and let it stand for 3-4 hours or overnight in the refrigerator. Serve with a slice of fresh lemon or pack in a bottle for to-go. Before drinking shake it all up as chia seeds would have settled at the bottom. Use coconut water or other fresh fruit juice for variations and added nutrition.